Booker T started his Pro-Wrestling career in WCW in the Early 90’s with his brother Stevie Ray as part of Harlem Heat. They faced many great tag teams, such as The Nasty Boys, Lex Luger & Sting , The Outsiders(Scott Hall & Kevin Nash), and The Steiner Brothers, just to name a few. As member of Harlem Heat they won the WCW World Tag Team Titles, ten different times. 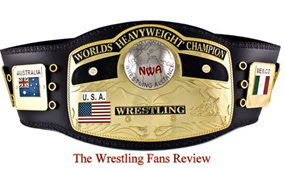 There after he became a single competitor and held the WCW World Television Title on six separate occasions. Booker T had a feud with The Crippler Chris Benoit, which led to one of the most exiting matches in WCW history, the matches were called Best of Seven Series. These matches culminated with a three way match for the title, in which Booker T was victories. 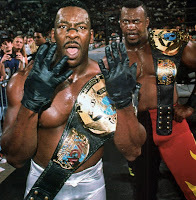 Booker T also won the United States Heavyweight Championship belt by defeating Rick Steiner. He held the US title only once in his WCW career, but to his credit he was the last US Champion in WCW history. Booker T became WCW World Heavyweight Champion at Bash at the Beach, by defeating Jeff Jarrett in an impromptu match. The original main event of the night was Hulk Hogan vs. Jeff Jarrett. The match needed to be changed because Hogan was fired live on the air by Vince Russo, after refusing to lose to Jeff Jarrett. Booker Held the WCW World Title on five separate occasions. His fourth and final WCW World title was won on the darkest day in Pro-wrestling history, it was the last Monday Night Nitro on March 26, 2001. Booker T defeated Scott Steiner, and became the last WCW World Heavyweight Champion. Booker reappeared on the WWE as the WCW champion as part of the Alliance. Booker T went back to his tag team roots and won the World Tag Team titles once with Goldust and once with Rob Van Dam. He won an eight man elimination match and became the WWE United States Champion. He held United States title three separate times. He also held the Intercontinental Championship once. Booker T defeated Bobby Lashely and became King Booker, by winning the king of the Ring Tournament. King Booker formed "King Booker's Court", which included Queen Sharmell, William Regal, and Finlay. King Booker won the World Title by defeating Rey Mysterio at The Great American Bash, and proclaimed to be the King of The World. Booker T also was the first Champion of Champion, when he defeated the ECW Champion, The Big Show and the WWE Champion, John Cena at Cyber Sunday. He later left WWE and joined TNA. In TNA Booker T invented a title for himself, it was called TNA Legends Championship. He also joined the Main Event Mafia, where Scott Steiner and booker became the TNA Tag Team Champions, by defeating Beer Money Inc. Then he left TNA.